I was very happy to have the opportunity to make this hat for a lovely bride recently. Her bridal outfit (which I hope to have photos of after the wedding!) was a 1890s-era style corset, jacket, and skirt made in black duchess satin with gray taffeta trim (all silk, of course), by Dark Garden Corsetry. I just love when the bridal couple wears color, and creates something really original and personal for their wedding day! These are some quickie photos taken before sending the hat out the door. 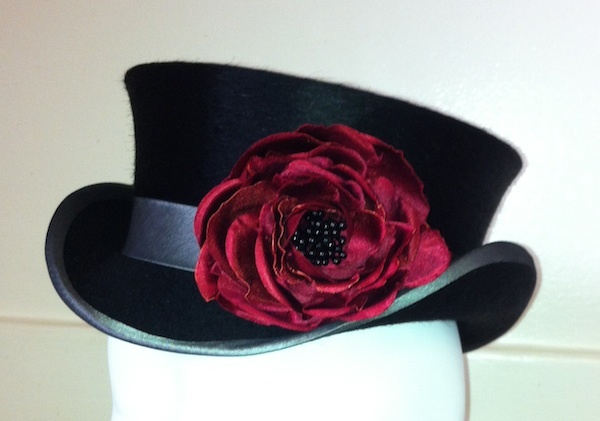 This is a 'Johnnie' style mini top hat, made in black long-nap fur felt. 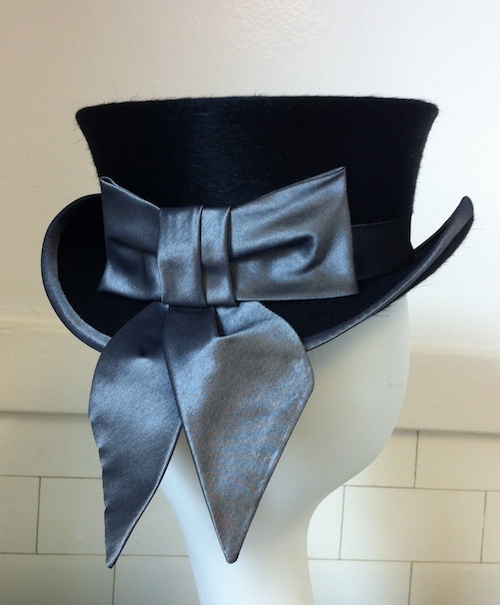 As you can see, I've used the same gray silk taffeta from her dress to trim the hat and bind its edge. The handmade flower was made using a heavy double-faced silk satin also used for the bride's jacket lining. The groom will wear a waistcoat in the same gorgeous blood red color. The peps chosen for the flower center, a shiny black, match the black patent leather buttons that decorate the bride's outfit. The hat also came with two sets of feathers (not pictured) that, when worn with the hat, mount behind the bow on its back. One set is a trio of curled black pheasant feathers, similar to the feathers seen on my 'Una' style. The other is two curled black peacock sword feathers, similar to the feathers on the 'Yvette'. 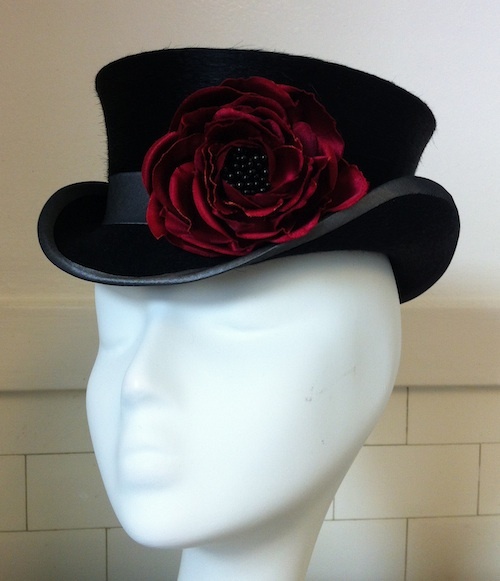 Look for more of the 'Johnnie' mini top hat in my new collection coming this fall! Beautifull!!!!! What a lucky bride,can't wait to see picture from the wedding!